Brunswick Corporation is one of Chicago's oldest companies and has a tremendous history steeped with change and innovation. 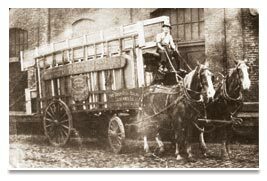 For more than 160 years, Brunswick has defined itself as a versatile company quick to spot trends and seize opportunities. Today, the company continues to uphold that reputation. There are only a handful of U.S. businesses that date as far back into history as does Brunswick, and an even smaller number of companies that have participated in as many industries. Throughout its storied history, Brunswick has owned the premier brands in a number of businesses, including automobile tires, phonographs, record labels, metal fiber, refrigerators, soda fountains, school furniture, defense equipment and medical supplies. Throughout Brunswick's evolution, one fundamental has remained consistent: its goal to be the best and all it entails in any industry of which it is a part. Driven by its customers' passion, Brunswick Corporation will continue to create market-leading brands and innovative, best-in-class products. Today, Brunswick is the market leader in the marine, fitness, bowling and billiards industries. No company has Brunswick's breadth and scope in the marine industry, owning such premier brands as Mercury engines, Sea Ray, Bayliner, Boston Whaler, Hatteras, Baja, Triton, Cabo and Trophy, among many, many others. No company equals Brunswick's quality and innovation in fitness equipment, owning such well-known brands as Life Fitness, Hammer Strength and ParaBody. And no company possesses Brunswick's knowledge and heritage in bowling and billiards - businesses in which the products bear the corporation's name. As evidenced by its current portfolio of businesses, Brunswick Corporation is a different company today than it was 160 years, 25 years or even five years ago. Today, the company continues to invest in its brands, create game-changing products, strategically position its businesses for stronger growth, and continuously improve productivity. The company's 27,000 employees around the world help accomplish these goals using fresh thinking and good old-fashioned hard work as the back drop. Brunswick Corporation began building its marine presence in 1961 by purchasing the Keikhaefer Corporation - the predecessor of Mercury Marine and Quicksilver. 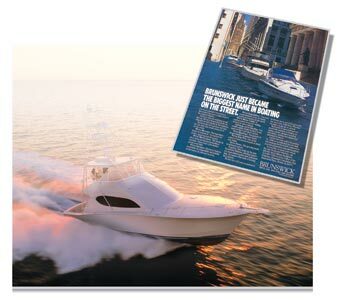 In 1986, the company became the undisputed global leader in recreational boating with the acquisitions of Sea Ray and Bayliner. Today, the company remains an industry leader owning more than 50 marine brands. 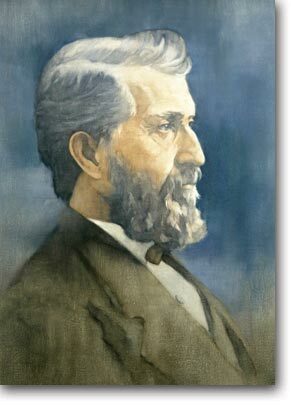 Brunswick Corporation began its journey as a leader in the recreation business in 1845 when John Brunswick sold his first billiards table to a successful Cincinnati meatpacker. Word quickly spread, and the company began establishing sales offices around the country. In 1848, Brunswick Corporation opened a sales office in Chicago. That office soon expanded to include two factories and an 8,000-square-foot billiard parlor on Washington Street. By 1888, Brunswick was one of Chicago's most successful businesses. The company operated out of a five-story building on State Street; and it owned two factories - one located at Rush and Kinzie; the other located at Huron and Sedgwick, which covered an entire city block, including a warehouse and lumber drying plant. It is believed that Chicago became the official company headquarters in 1907. In 1925, the company was listed on the New York Stock Exchange and is among the longest-listed stocks on the exchange. To accommodate its booming growth, Brunswick moved its headquarters to suburban Skokie, Illinois, in 1964 and then to Lake Forest, Illinois in 1993, where the global headquarters remain today. In 1878, Brunswick expanded its product offering to include elaborate and ornate front and back bars made of rich woods, flawless mirrors and stained glass. These front and back bars can be seen in taverns around the world - including Chicago's very own Coogan's tavern (180 N. Wacker Drive), one of about 150 back bars known to still be in service. In 1855, Brunswick hired scientists to study rubber and conduct experiments with the substance. In 1906, Brunswick introduced a revolutionary rubber bowling ball - the Brunswick Mineralite; and in 1912, the company began manufacturing the Whale-Bone-Ite rubber toilet seat, as well as rubber tires, the rights to which were eventually sold to B.F. Goodrich. In 1872, company craftsmen, under the personal supervision of John Brunswick, built the Brunswick Library at St. Ignatius College Preparatory School in Chicago. One hundred and thirteen years later, the Brunswick Foundation funded the restoration of the library, which has become known as a masterpiece in wood. In 1915, Brunswick began creating piano cases and phonograph cabinets - a business that eventually led to the creation of the Brunswick Record label. The first record under the Brunswick Record label appeared in stores in 1920; and big stars soon followed with exclusive recording contracts - Duke Ellington, Benny Goodman, Cab Calloway, among other legendary musicians. One of which was Al Jolson, who later became a member of the Brunswick Board of Directors. In 1930, Brunswick sold the business to Warner Brothers. In 1935, Brunswick introduced the revolutionary table-top refrigerator called the Blue Flash and a new line of soda fountains. In 1952, Brunswick began manufacturing school furniture and gymnasium equipment, which would later win a gold medal from the Industrial Designers Institute. That business was sold in 1969. In 1958, Brunswick entered the medical products business with the purchase of the A.S. Aloe Company. In 1968, following a decade of acquisitions, Brunswick's medical products companies become a wholly owned subsidiary - Sherwood Medical Industries, Inc. The subsidiary was sold in 1982 following an aggressive, hostile takeover attempt. Brunswick began helping the war effort during WWI, but it wasn't until 1941, when the company began to dedicate full-time resources in support of the government's defense efforts. Brunswick divested its defense and technical businesses in 1993 to return to its leisure and recreation roots. In a quest to become the "General Motors of Sports," Brunswick enters the sporting goods business by acquiring MacGregor Sports Products in 1958. Other acquisitions would eventually include: Zebco, Doll, Martin Reel, Browning and Thompson fishing tackle and reels, Ben Pearson archery, Igloo coolers, Mongoose and Roadmaster bikes, Remington outdoor accessories, among many others. The divestiture of the sporting goods/outdoor recreation business was completed in 2001. Today, Brunswick is the market leader in the marine, fitness, bowling and billiards industries.